The festival is a call for rain and a celebration of fertility. In the afternoon, people gather in the fields on the outskirts of villages and towns to launch self-made firework rockets. Different communities compete for the best decorated and the highest travelling rocket. Men disguised as women perform vaudeville acts using wooden phalli in order to anger the gods. As revenge, the gods are expected to send thunderstorms. I have written a previous article based on what I learned and witnessed at the 2014 Bun Bang Fai and this is an update to that previous article and also includes extra video footage of the rockets. Bun Bang Fai Rocket Festival is an ancient local festival, which is associated with Thai traditional beliefs in the supernatural powers that help promote the production of rice crops for the coming planting season. In the rainy season, the local people believe that the god would hear the entreaties that they create a rocket or ‘Bang Fai’ to send to heaven, and bless them with plentiful rain for rice cultivation. So, the celebration is entirely to the god of rain. On the festival day, the beautiful rockets in different styles are paraded to the launch site. The local people dress in colorful traditional costumes and dance to accompany the procession. The highlight of the festival is the launch time. The rockets are fired from their launch platforms one by one. Noisy folk music and cheers can be heard for each liftoff and the rocket that reaches the greatest height is declared the winner. When the Lord Buddha was in his bodhisatta … incarnation as King of the Toads Phaya Khang Khok … and married to Udon Khuruthawip … his sermons drew everyone, creatures and sky-dwellers alike, away from Phaya Thaen (King of the Sky). Angry Phaya Thaen withheld life-giving rains from the earth for seven years, seven months and seven days. Acting against the advice of the Toad King, Phaya Naga, King of the Nāga (and personification of the Mekong) declared war on Phaya Thaen—and lost. Persuaded by Phaya Naga to assume command, King Toad enlisted the aid of termites to build mounds reaching to the heavens, and of venomous scorpions and centipedes to attack Phaya Thaen’s feet, and of hornets for air support. Previous attempts at aerial warfare against Phaya Thaen in his own element had proved futile; but even the Sky must come down to the ground. On the ground the war was won, and Phaya Thaen sued for peace. Naga Rockets fired in the air at the end of the hot, dry season are not to threaten Phaya Thaen, but to serve as a reminder to him of his treaty obligations made to Lord Bodhisatta Phaya Khang Khok, King of the Toads, down on the ground. 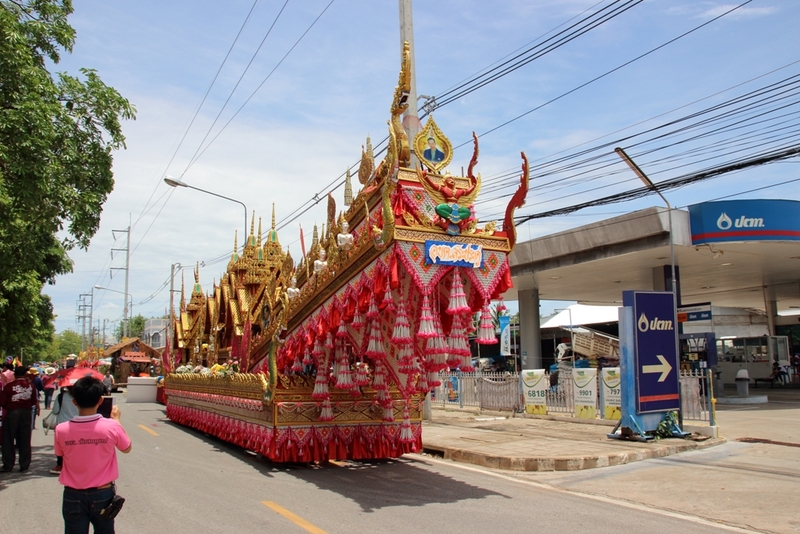 For his part Phaya Nak was rewarded by being given the duty of Honor Guard at most Thai and Lao temples. I have been told by one of my Buddhist friends that this is not a Buddhist belief but only a Laos legend and this is not a Buddhist festival. However whichever version you decide is best I will give you my personal experience on the procedings. It is a lot of fun and it is a fertility festival so there are many phallic objects on display in many varied shapes and forms. There is lots of colour, lots of music and lots of dance. There is also lots of cross dressing. I have included three videos for you to watch. The video at the top of the page is all rockets so there is no risk to sensitive individuals that may have issues with phallic objects, provided that is, that you do not consider rockets as phallic objects… then you will have a big problem even with the first video with rockets going off in all directions with lots of joyous shouting. In the first of the two videos below, I have edited out all the phallic objects for those that may be a little sensitive on this subject. For those that are not sensitive on this subject, the second video includes most of the phallic images that I took at the Phu Toei Rocket Festival on the 22nd of May 2016. Edited video above. Phallic sections have been removed for sensitive viewers.